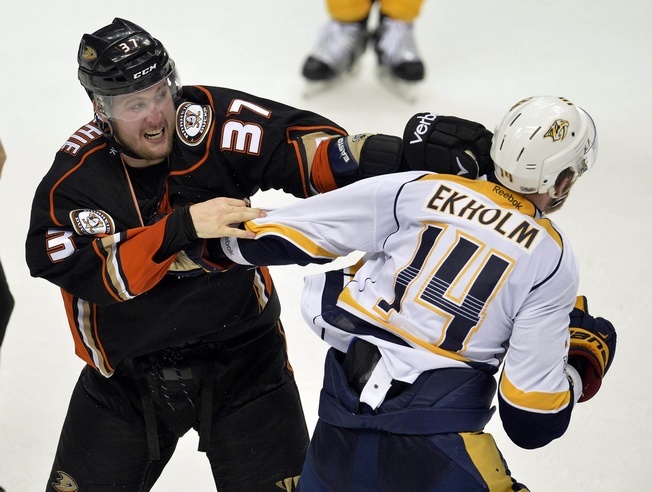 The Nashville Predators are not eager to face a Game Seven situation in their Western Conference Final series against the Anaheim Ducks. That’s a given. The Predators took home a 3-1 win in Game Five for a 3-2 series lead and will waltz into the Bridgestone Arena on Monday with hopes of making history. History hasn’t been at the forefront of Nashville’s vision, though, and the team’s been taking it game by game by game. Getting that next win isn’t going to be easy against a tough Ducks team, especially as Nashville is without centre Ryan Johansen. Centre Mike Fisher missed Game Five after leaving Game Four with an undisclosed injury. Still, depth came through for the Music City marvels. Colin Wilson, Austin Watson and Pontus Aberg had goals in Game Five. Nashville has continued to press, even in the face of injuries, and the approach is paying off. Their tendency to keep defencemen at the offensive blueline has led to increased pressure, even if Anaheim can take advantage in transition and catch the Predators in the gaps. Of course, the Ducks are also facing adversity going into Game Six. Goalie John Gibson left Game Five and was replaced by backup Jonathan Bernier to start the second period. There’s currently no word on his status for Game Six. Rickard Rakell missed Game Five due to injury. They’ve also been without Patrick Eaves. But the Ducks have held the advantage in the faceoff circle, despite a few missed opportunities in offensive zone over the last few games. Puck possession will be key, especially with Nashville rolling in front of their home crowd. With both teams facing adversity going into Game Six on Monday, it’s the little moments that could swing the whole series. The Predators have the advantage and can play their game with a bit of a cushion, but you have to believe they’ll be pushing for the win in Nashville to close out the series.